If you’re looking to pick up a centre it probably means something has gone terribly wrong for you this year. Centre is the deepest position in the league and it’s likely there are teams with an excessive amount of centres that you can trade for. However, if you’re too cheap to address your needs through trade you can look to the waiver wire for the Leafs’ “number 1 centre”. Grabovski is currently riding a three game goal streak and has goals in six of his last seven games. 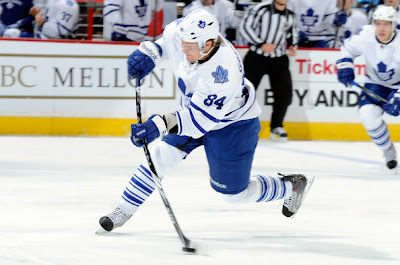 He has 23 points on the season and is miraculously a plus player, even on the lowly Leafs. The young Oiler was the buzz of the league with a fancy, yet completely pointless spin-o-rama during a shoot-out against the Lightning in his first game in the NHL. He has four points in four games, although three of those came in one game against the Blue Jackets. He scored 26 points in 26 games in the AHL and even scored 5 goals in one game… against the Toronto Marlies (making the big club proud). With Shawn Horcoff out for an extended period of time the talented Swede should get a good look on the top two scoring lines. Earlier this year Pacioretty stated that he would rather play on a scoring line in the AHL than a checking line in the NHL. That caused every old-timer’s head to explode, except it shows that Pacioretty understands his talents and knows the role he’s best suited for. The Canadiens recently called him up to the NHL and are giving him every chance to play in a scoring role – currently using him on the second line with Gomez and Gionta. Before his call-up Pacioretty was leading the AHL in scoring with 17 goals and 15 assists in 27 games. He’s since added a goal and an assist in two games with the Habs. The Anaheim D-man is second in rookie scoring by a defenceman with 17 points, although he’s not going to help you in the +/- department as he’s sporting a -6. Regardless, he’s averaging more ice time (22:16) than any other rookie and averages over 3 minutes a game on the power-play. He should be able to produce solidly from the backend for the rest of the season and will receive some consideration for rookie of the year. Meszaros currently leads the league in +/- with an impressive +22, along with 13 points, accumulated all while playing on the third pairing of Philadelphia’s defence. With Chris Pronger’s injury, Meszaros has joined Matt Carle as the Flyers’ top-pair. He’ll receive more power-play time, although he’ll now be facing tougher competition meaning his +/- might take a hit. If you don’t have a good goalie already you’re in trouble. Owners are generally unwilling to give up their goalies and if you are persistent enough to score one it’s likely you overpaid. Furthermore, most goaltending battles are decided by December and if they aren’t, you probably don’t want either combatant. With that in mind Jose Theodore looks poised to take over the starter’s job from Niklas Backstrom in Minnesota. The former Vezina winner has a .915 SV% along with a 2.71 GAA. Hopefully you aren’t picking up Theodore as a starter. Uh, scratch that...it looks like Backstrom has a firm hold of the number 1 job. It was a good ride for Theodore while it lasted.